The Glycemic Index system ranks foods from 0 to 100 according to the effect on blood sugar levels after eating. Developed in 1981 by David Jenkins and Thomas Wolever of the University of Toronto, the Glycemic Index was used for the management of diabetics. The Glycemic Index or GI, for short, replaced the older method of classifying carbohydrates, either "simple" or "complex" in structure. Whole grains like oats, whole wheat, and brown rice are very nutritious high fiber foods. They keep the bran and the germ intact, which are abundant in vitamins, minerals, fiber, and important phytochemicals. High fiber foods are digested more slowly, and so there is a more modest effect on blood sugar than refined or processed carbohydrates or sugars. Most carbohydrates are digested into glucose which then enters the bloodstream, causing an increase in glucose levels. is digested almost immediately to glucose, causing blood sugar to spike rapidly. Brown rice, however, is digested more slowly, causing a lower and more subtle change in blood sugar. When you eat foods that have high-GI numbers, you may feel an initial boost in energy and mood as your blood sugar rises, but this is followed by a cycle of increased fat storage, sluggishness, and even more hunger. Low-GI foods (less than 55) produce a gradual rise in blood sugar that's easy on the body, keeping blood sugar levels fairly tame. Foods between 55 and 70 are intermediate-GI foods . Foods with high-GI numbers (more than 70) make blood sugar as well as insulin levels quickly surge. A GI value tells you only how rapidly a particular carbohydrate turns into glucose. It doesn't tell you how much of that carbohydrate is in a serving of a particular food. Adding protein and/or fat or increasing acidity may alter the GI of any given carbohydrate-laden food. Glycemic load was developed by scientists to describe the quality (glycemic index) and quantity of available carbohydrates, like starch and sugar, in a given meal or diet. The glycemic load measures the effect of the glycemic index of a certain food times its carbohydrate content in grams in an average serving. High fiber foods such as whole-grain rye bread and bran cereal are rated low on the GI because they do not produce a rapid rise in blood sugar after eating them. Whenever possible, replace highly processed grains, cereals, and sugars with minimally processed whole-grain products. 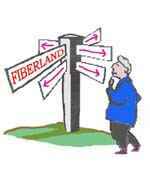 High fiber foods are crucial when balancing a low glycemic diet. They are more difficult for the body to digest, stay in the body longer, and keep you feeling full so there is less need to eat more. This also effects the amount of fat absorbed in the body, and less calories to burn off. High fiber foods give you an excellent low score on the GI. Share this valuable tip with a good friend!